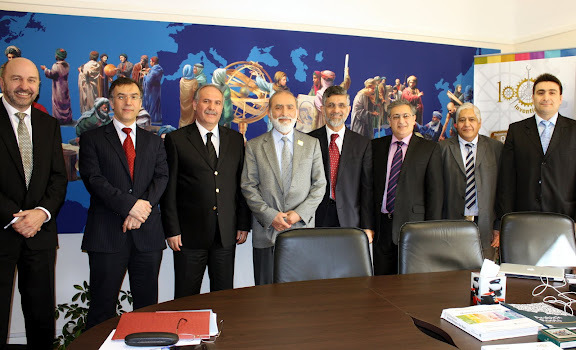 As part of their visit to UK, Marmara University rector Prof. Zafer Gül and vice-rector Prof. Hamza Kandur visited the Foundation for Science, Technology and Civilisation on 20th March 2012. Prof. Gül and Kandur were welcomed and hosted by the Prof. Salim Al-Hassani, President of FSTC, Prof. Mohamed El Gomati, Chairman of FSTC, and FSTC trustees. 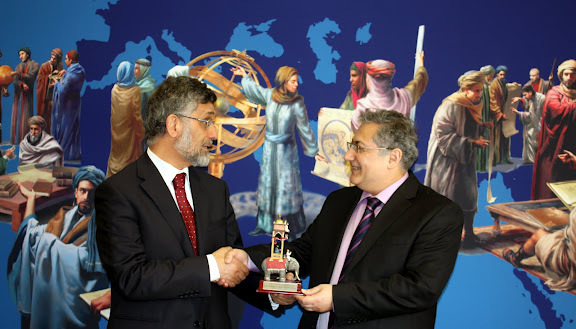 In appreciation of Marmara University and Prof. Zafer Gül for hosting the MHANT meetings over the last three years, Prof. Mohamed al Gomati presented an elephant clock of famous Muslim engineer Al-Jazari to Prof. Gül. Development of a manual for university lecturers for use in STEM subjects. In the meeting, it was agreed that the existing collaboration should be continued and improved by implementing these projects. After the meeting, a lunch was given in honour of Prof. Gül and Prof. Kandur. 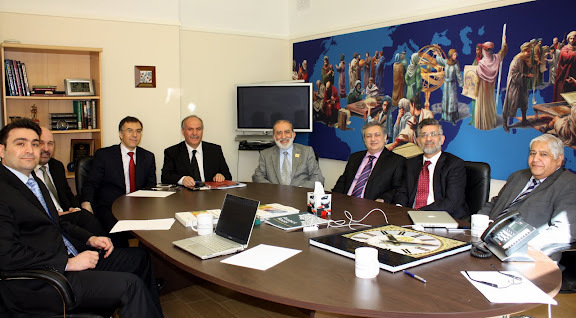 "Muslim Heritage Awareness Network of Turkey's (MHANT) second meeting, which was organized by the Foundation of Science Technology and Civilisation (FSTC) has been held in Marmara University's chancellery building in Istanbul on 20th April 2011. At the beginning of 2009, we lost our colleague and friend Professor Gunhan Danisman, a member of the Muslim Heritage Awareness Network in Turkey (MHANT) and an eminent scholar who passed away in Istanbul where he had lived for many years. In the following, we present an obituary as a tribute to his memory. In the aftermath of the success visit of "1001 Inventions" to Istanbul in the summer 2010, FSTC established the network "Muslim Heritage Awareness Network Turkey" (MHANT). On Friday 1st October 2010, thirty Turkish academics met to launch the MHANT at Marmara University in Istanbul. Professor Salim Al-Hassani, Mr Peter Fell and Dr Anne-Maria Brennan attended as representatives of FSTC. During the meeting praise was given for the success of the 1001 Inventions exhibition in Istanbul which attracted over 400,000 visitors, many of whom were children and young people.